This was a time when the aristocracy indulged in a very liberated and pleasurable life style. The backdrop for their witty repartee and enlightened conversations was the intimate rococo interior. The word Rococo comes from the French word for shell or rock, rocaille; this motif can be seen in many of the ornate and playful interior decoration that emerges specifically in the townhouses of aristocrats in Paris in the second part of 18th century. The high ceilings with large mirrored walls where the juncture between the wall and the ceiling seems to blend in, organic forms gilded of gold, arrangements of cupids, flowers, vines and figures, all very sinuous and fluid, forming arabesques are all typical motifs of the rococo style. This was the time of the Enlightenment, philosophers, writers and artists believed in the power of reason which could explain all natural phenomena. The playful libertine spirit of the age stimulated a new freedom of thought, and a willingness to challenge the convictions of the past. In this portrait by her favorite painter, Boucher, she is shown with a book in her hand which points to her aptitude for learning, the feather in the drawer by her side points to the fact that she writes as well. Books and manuscripts are strewn everywhere from the armoire behind her to the floor underneath the nightstand, all the signs of her interest in bettering of self. 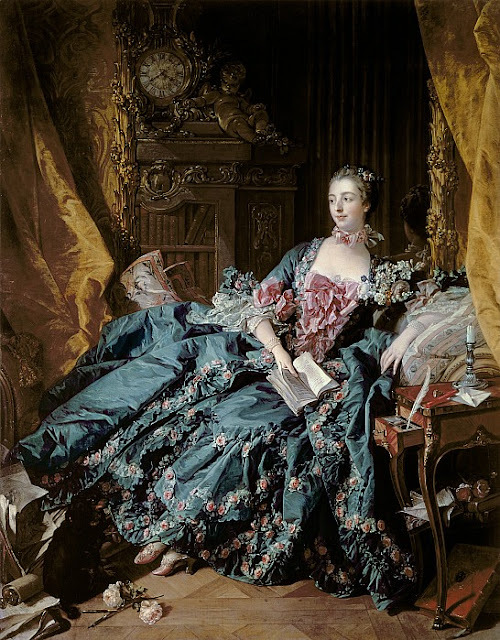 The sumptuous, satin dress she is wearing, decorated with satin bows and flowers, the cupid on top of the armoire behind her, the luxurious, excessive curtains and the roses at her feet are all the typical rococo elements of this painting. Her feet peaking underneath her dress point to her promiscuous nature since no lady of good breeding could show her ankles in public.